What to do with skinny Thai eggplant? Discussion in 'Recipes' started by siduri, Oct 5, 2010. 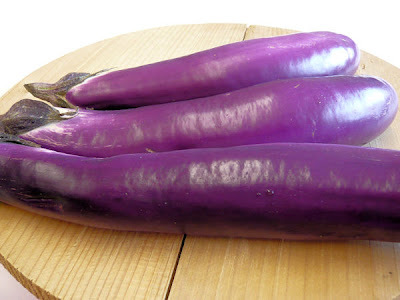 I looked up thai eggplant and found this. This doesn't sound like what you have at all. Yeah, koukouvagia, it's quite similar (I imagine there are different varieties) - mine are thinner and longer and more twisty, about the width of a finger. The picture you posted seems like they're shorter and thicker - in which case cutting them in slices would make more sense. I was a bit confused by the nomenclature. Most Thai eggplants I'm familiar with are small, round, and bitter. And many of them come in bright, almost neon-line, colors such as orange, green, and purple. The description (and picture) are more like the Ping Tong Long and similar Japanese eggplants---which, in their usual way, the celebrity chefs are calling "Asian." Siduri, the answer to your questions are "yes." There are numerous ways of using them, and they can be sliced crossways, divided in half the long way, thinly sliced the long way, etc. I would suggest that you initially think of them as zucchini, and use them in that manner. Split and stuffed, for instance. Or cut in half and grilled. Or.....well, you get the idea. Keep in mind, too, that there are only two differences between these and the ones you are used. Size, and the fact Japanese eggplants are rarely bitter, so do not have to be salted and drained. Within that framework there's no reason you can't adapt eggplant recipes you have to these. Cut peppers into 1/2 inch slices. Peel eggplant and cut into 1/2-3/4-inch dice. In a large bowl combine the eggplant, peppers, garlic and oil. Toss well and spread, in one layer, on a baking sheet. Roast 25 minutes, stirring once halfway through. Spread mayo on 4 French rolls, tortillas, or pitas. Lay one slice of cheese on top of the mayo. Mound one fourth of the veggie mixture on each sandwich. Top with basil and remaining cheese. Wrap each sandwich in foil and return to oven for 10 minutes until heated through. Immediately remove foil so the cheese doesn't stick. How come you say to peel them? Do usually peel eggplant or is this a different kind that has tough skin. I never peel eggplant usually, nor do i salt it to remove the bitterness. Either the eggplants here are less bitter or i like the bitterness. Now how strange for the name, here they said they were "Tailandese" (thai) but i also bought some others once in some special market and they were called thai and were all colors and tiny round egg-things like you say. But italian nomenclature is not very precise and italians are not so familiar with asia and it wouldn;t surprise me that the guy was just ignorant of the type of eggplant he had. I just automatically peel eggplant most of the time, Siduri. No particular reason except pernicious habit. If they're as thin as you say, I'd just slice them so the width was about the same as the diameter. Probably no need to peel. The peel on skinny eggplant is usually quite thin and relatively tender. But steam one, give it a bite and see what you think. Among all the usual ways of cooking eggplant, the thin Asian types are especially wonderful spicy. Since yours are practically noodle thin, you might as well play with their appearance. Try roasting them, cutting to an appropriate length (if necessary) while hot, and saucing arrabiata. steamed eggplant, bdl?. why would anyone steam eggplant? Not sure i want to cover these eggplants in a tomato sauce, but the idea of using them in a pasta dish is interesting, maybe with a pasta of the same width like tortiglioni, with eggplant also cut the same size - maybe garlic, peperoncino, parsley, basil. But my concern is that if they're just cut into lengths, the flavor of the garlic, etc, won;t penetrate into the meat. And though i said not ONLY asian, that doesn;t exclude asian. I have little experience with asian cooking techniques, and my knowledge is limited to a couple of japanese or chinese dishes. Okay, so roast it, poach it, boil it, poele it, microwave it. It doesn't matter. The idea is just to test the skin. I wasn't suggesting eggplant with the pasta, I was suggesting it instead of the pasta; or if you prefer, as the pasta. Eggplant with the pasta, I know you have covered. You're talking pasta 1/2" in diameter and you're willing about getting extra flavor into the meat of the vegetable? For why? Whuffo? The sauce should carry enough flavor with each bite to take care of it. As to Asian... I'm very fond of small eggplant in black bean sauce with lots of garlic and chilli. Also, if you can get your hands on "chili garlic" sauce you could use that instead of black bean sauce. Cut the eggplant into bite size pieces, wok them in hot oil until tender, remove them. Stir fry the usual aromatics (garlic, scallion, ginger) until you get a nice smell (1 or 2 minutes at most), add a little bit of ground pork and brown it till it breaks up. Then add the sauce, some broth, some soy sauce, a healthy splash of sherry (or madeira) if you can't get Chinese cooking wine, some corn starch slurry -- you know the drill -- cook it down until the starch starts to set up the sauce. Return the eggplant to the wok, tossing it for a minute to get it hot. Then turn out and serve. If you want to cut down on the oiliness, par boil the eggplant for a minute before wokking. You could also do the eggplant in any number of Indo/Pak ways. Look for "brinjal" recipes on the net if you don't have a lot of "curry" techniques already. I think that diameter begs for breading, deep frying and service with "dipping sauces," like aioli, salsa verdes, chimichurri, even a "nacho cheese" fondue. You could do a nice breading mixing flour, polenta and bread crumbs in one ratio or another. Okay, so roast it, poach it, boil it, poele it, microwave it. It doesn't matter. The idea is just to test the skin. Oh, i thought you meant that steamed eggplant skin is tough. I wasn't suggesting eggplant with the pasta, I was suggesting it instead of the pasta;Yeah, i got that, but not a fan of stuff in tomato sauce, but you gave me the idea of putting it with pasta, of the same shape and size. or if you prefer, as the pasta. Eggplant with the pasta, I know you have covered. You're talking pasta 1/2" in diameter and you're willing about getting extra flavor into the meat of the vegetable? For why? Whuffo? The sauce should carry enough flavor with each bite to take care of it.well, if the sauce (which in this case i mentioned wouldn't involve tomato, so there would be little substance to flavor each bite) doesn;t permeate the eggplant (aqnd if the eggplant stays in its skin and doesn't permeate the sauce), you get pieces of something in garlic flavored oil. As to Asian... I'm very fond of small eggplant in black bean sauce with lots of garlic and chilli. Also, if you can get your hands on "chili garlic" sauce you could use that instead of black bean sauce. now i remember why i rarely cook any asian cuisine - ingredients are hard to find. And raises questions like what is black bean sauce in italian? and the few stores that carry asian ingredients are frequented almost exclusively by the asians themselves, so they often don't have the translated label on the jar, though technically they;re supposed to. But since i live on the edge of what has become chinatown, I'll take a look. (I take it that chili garlic is not going to be equivalent to chili and garlic, right?) Cut the eggplant into bite size pieces, wok them in hot oil until tender, remove them. Stir fry the usual aromatics (garlic, scallion, ginger) until you get a nice smell (1 or 2 minutes at most), add a little bit of ground pork and brown it till it breaks up. Then add the sauce, some broth, some soy sauce, a healthy splash of sherry (or madeira) if you can't get Chinese cooking wine, some corn starch slurry -- you know the drill -- cook it down until the starch starts to set up the sauce. Return the eggplant to the wok, tossing it for a minute to get it hot. Then turn out and serve. If you want to cut down on the oiliness, par boil the eggplant for a minute before wokking. Ok, i'll try that if i can find the ingredients. Or fool around with it to adapt. I think that diameter begs for breading, deep frying and service with "dipping sauces," like aioli, salsa verdes, chimichurri, even a "nacho cheese" fondue. You could do a nice breading mixing flour, polenta and bread crumbs in one ratio or another.ok, but when i deep fry breaded eggplant, the skin usually rejects the batter and it only adheres to the cut surfaces. I never thought to ask if you have a grill. If so, a grilled veggie & farro salad is really nice. Split and grill the eggplants as Joey suggests. Do the same with zucchini, thick slices of onion, and wild mushrooms of your choice. You want to grill the veggies so they have char marks and are cooked through, but still a bit al dente. When cool enough to handle, cut the veggies into bite-sized chunks. Prepare the farro. Toss the cooked farro and veggies. Prepare a vinegraitte using evoo, lemon juice, red wine vinegar, a little Dijon mustard, salt and pepper. Lightly toss the salad with the vinegraitte. Be careful not to overdress. snow on the mountaintops here and cold air movin in......hows the pumpkin patch? Farro is, indeed, an ancient grain, Joey. It was the basic ration of the Roman Legions. Reason it's so rare, in the U.S., is that there's only one commerical grower (Anson Mills), and it's available from them only in limited quantities. The rest is imported. Only place I've been able to find it is in The Fresh Market. What I get there is a 1-pound vacumn-sealed package, imported from Italy. Not the least expensive grain, by any means. But there's just the two of us, and a pound goes a long way. the little mini's in supermarkets...are they edible? Sure. In fact they make perfect edible bowls for individual servings of pumpkin soup. Why not? It fact it sounds great as a panini, with or without the mayo. I do something very similar with quinoa or with black rice (they call it venere rice (venus rice) or forbidden rice (like forbidden city, the emperor of china and all that) or both together, with mixed grilled vegetables, roasted chopped carrots and celery and onion , with a little brown sugar to caramelize, in summer tomatoes or roasted tomatoes, sometimes some grilled shrimp. as for the grill, yes, I have one but I wouldn;t have made it as a vestal virgin on two counts. For one i can't light a fire for the life of me. My son brought me back a chimney thing from the states, and besides being terrified by the vortex of hellfire it shot up after a bit, it lit the charcoal all right, and burned it half up! There was practically not enough left to make bruschetta! I've given up. My husband doesn;t come from a culture that thinks men should barbecue, so he's no help. (He does make the bread now though). I dream of one of those stupid gas grills everyone has in the states, with its ceramic coals and instant lighting and cover. But as it is, I use the gas stove and a grill pan (cast iron with ridges). You probably waited too long to dump the chimney, Siduri. If you load it properly (not more than two pieces of newspaper, loosely crumbled), it only takes about 15 minutes before you should dump the coals. They won't all be ready, at that point, but the hot ones (those that had been closest to the bottom of the chimney) will take care of getting the others going. Once there's a uniform coating of gray ash you're good to go. I love the chimneys. Easiest way in the world to light charcoal without using chemicals. Wish I'd known about them years and years ago. This kind of egg plant is very tender, not bitter, and delicate in flavor. I just steam them, a little EVOO and oyster sauce.